Vijay Hazare was the captain of Indian Test team which registered the first win by an Indian Team in a Test match. He was regarded as one of the finest batsman of his time. Here we have concluded about his cricket profile, cricket career and Test & first-class records. Vijay Hazare is a legendry name in the Indian cricket history. One of the finest batsman of India, he was also the former captain of Indian Test Team. He was the captain of the Team which registered first ever victory by Indian cricket Team in Test cricket. A One Day Ranji tournament was started in 2002-03 named on his name as Vijay Hazare Trophy. In 2004, Vijay Hazare died. Vijay Hazare got his Test cap in 1946 against England at famous Lord's Cricket Ground. His score in that match were 31 and 34. He became the victim of Sir Alec Bedser who had a match figure of 11/143 in that match. In the next two matches his scores were 3, 41 and 11 runs. During 1947-48 Tour to Australia, he scored hundreds in both innings of the Adelaide Test against the famous 'Unvincible Australians' team led by Don Bradman. 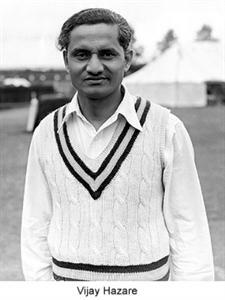 When England toured India in 1951-52, he was the captain of the Indian Team. In one of the test of the series in Madras, the Team India registered its first Test victory. He become the first Indian to complete 1000 runs in Test cricket. Hazare was also a good medium pace bowler. He has 20 wickets in his International career. He has taken the wicket of Don Bradman three times in his career. His best bowling figure in Test cricket was 4/29. Hazare has scored plenty of runs in Indian domestic cricket. He has scored 18740 runs with a batting average of 58.38 in first-class cricket. Only three other Indians Sachin Tendulkar, Rahul Dravid and Sunil Gavaskar has scored more runs than him in first-class cricket. 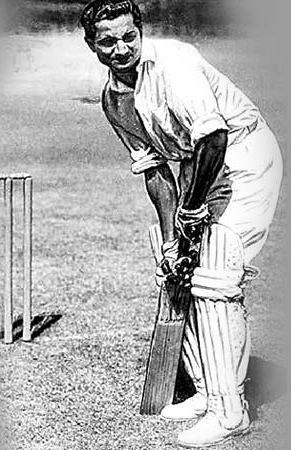 His first successful season on Indian domestic cricket was in 1939-40 when he made 697 runs in 5 matches. He also scored his best first-class score of 316* against Baroda. In 1940-41 season, he scored 1139 runs in 11 matches with a batting average of 87.61. This was first time when he scored more that 100 runs in a season. Seven more times he repeated this feat with 1423 runs in 1943-44 is highest. Hazare's bowling record in domestic matches is much better than in Test matches. He has 595 wickets in first-class matches (including 20 in Test matches). His bowling average of 24.61 is also better than many frontline bowlers. In his only second match against Bombay playing for Maharashtra, he took 6/73 in the Bombay's first innings and total 8 wickets in the match. HE has tken ten wickets in a match three times and 5 wickets in an innings 27 times.